Dear friends — a wonderful Threadless t-shirt as well as a cake pan based on the t-shirt inspired this tiny tale. The children, and even the oldest of the senior citizens are waiting for the ice cream truck. They are waiting on their porches of boredom, their patios of — well, despair is putting it too strongly, so let’s call them patios of despondency which is fancier and somehow more gentle. Some porches and patios are nice and fancy and some are worn down, cracking or nonexistent, but the fact of the matter is that through out SoCal it’s hot as blazes and even the kids with the expensive video games are too hot to play them. So all there is to do today through the southern half of the state to wait for is the ice-cream person, who is generally but not always a man, and who is also generally not from around here, who generally comes to the truck as his or her business and who is gifted for some reason with the dispensing of sweets. Yes, they wait for him. In the hot boiling summer, the dry baked summer, which isn’t summer at all but rather spring, but this is what happens with global warming. You get summer when you don’t want it, and floods and ice when you do. Where is the ice-cream man? He isn’t coming. Here’s why. A giant walrus has flown in from Russia or Tasmania – no wait – not Tasmania or the arctic circle or the north pole. I’m not sure where the giant walrus came from, but well, here he (or she) is. Big and grey like a whale only with tusks he lies on the big street often (but not always) called Main Street, and the ice cream truck is blocked entirely! Mystery solved. Yet the problem remains. The ice-cream truck technician or driver or just person, gets out, resplendent in white, although he sells many flavor of of ice cream and consequently many colors too (and therefore should have a more exciting outfit in terms of hues). The ice-cream man He pushes and pushes against the behemoth, who looks down at him kindly. Not budging. The children wait on their patios of boredom, their porches of nothing but stick ball and television, but eventually they realize through ice-cream empathy (aka twitter), that they will have to walk and bike and skateboard and scooter to the main street. They do, and the old folks tag along with walkers and motorized chairs, and if they can’t walk they place their order with the children, because it’s clear that children are our future and we should let them lead the ice-cream way. And there is our luscious surprise. 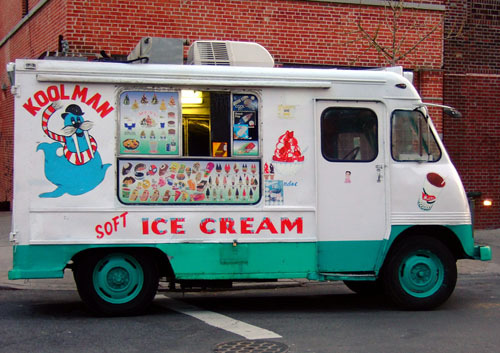 The truck filled with ice-cream and the big friend lying on the street, as big as a roller coaster. The kids and old folks line up and the man in the truck dispenses carefully, and the kids who are waiting climb up the big walrus and slide down. How wonderful. Something’s finally happening. But ice-cream is not excluded. “Why did you come here?” a grandmother asks the walrus. ‹ PreviousThe Writing Process Blog Tour continues at Magically Real! Ha! well, we’ve all be there, haven’t we? Hope you enjoy the rest! Ah, to live in a place where the ice cream person is needed and welcomed. We shall not see him/her until July, the way things are going this winter. good point. there ARE upsides to living in SoCal!